Mimi's Corner! : MOUSE OVER HERE!!!!! We are off to visit our daughter in Orlando, Florida and we will be visiting these 2 friendly mice again!!!! Camdyn just squeals with delight everytime Mickey Mouse playhouse in on t.v. so we are in store for a very fun time!!!!! I will blog every few days while away to keep you posted on our fun days ahead!!!! Now that is a mouse I could live with ! LOL! How cute! Those pics are too precious! Have fun ... humm, I don't think I have to tell you that. BTW, you asked where I had worked on my internship. I had done lifeguarding at the Port Orleans and Dixie Landing's Resorts as my job and then did a little extra at Blizzard Beach. Such great times ... now that I'm getting unpacked from my move I am planning on posting some pics from my time there. Have fun. Wish the mice that were around here were like the ones you'll be seeing! I'm off to a Baby Shower for one of my pregnant daughter in laws and baby boy that will be delivered by c-section Oct. 26th! 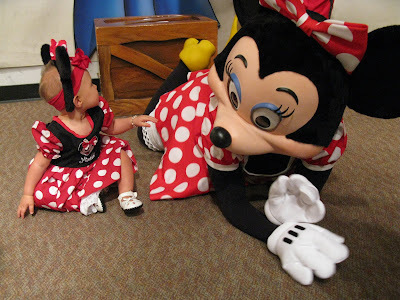 My Mom and sisters and I went on a Disney Cruise this past winter, what fun and a delight to see all of the little girls and boys dressed like their favorite characters and interacting with them...it was just a joy! I highly recommend Disney Cruise Line! I know you will have a fabulous time and we will have a fabulous time enjoying your pictures. Can't wait to see them. Have fun! I can't wait to see all the fun pics!! I love Mickey and Minnie, too. You are going to have such a wonderful time! I like your banner...a great picture! 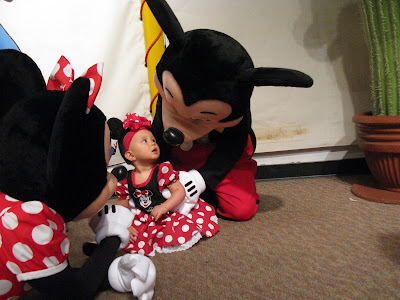 Jamie wow those mice look like fun lol, I wish I could take my girls to Disney Land they would love it. I hope you have a great time, and will pray for a safe journey for you. I am so jealous you have little ones to hug on. Mine are all too old, they think for me to hug on. We are having fun watching all the basketball and football and volleyball and track. Whew makes me tired, but I love it. Enjoy your trip! And don't forget to take pictures for us! Have so much fun! I mean I know you will. As it is your 2nd home. You guys really know how to do Disney! Enjoy your time with your girls, as I know you love every min. of it. Can't wait to see all your fun pictures and hear all about it. Have a good time.Enjoy those two sweet mice...whats there name's again?? ?Camdyn looks so sweet in the same dress as Mini. What a fun place! Have a good time!